These vials are small so they won't use up a lot of your (often expensive) components. They can be easily hidden for the discreet witch. They can travel with you in a pocket, car or necklace. Today, by popular demand, I'd like to explore how these vials can be used in the Craft. This is by no means a comprehensive list but should be a great spring-board for spell work ideas. At the end, I'll leave you with five recipes I've successfully used myself! Small Bottles or Vials: You can use any variety of small bottles from cork to screw lids, or even upgrade to larger containers such as jars. It's really up to you. For our purposes today, I'm using glass vials with cork toppers that I already had available. Glue or Wax: While a variety of ways to close these little vials exist, I would suggest sealing them with either some sort of glue or with heated wax. You can always decorate the seal later in a multitude of ways, but at least wax or glue ensures the cork or screw lid isn't coming off - at least, not without some effort. A word of caution: Be careful of burning yourself when working with anything hot. Semi-Precious Gemstone Shards: It's important that you're working with gemstones that will fit within the opening of your vessel. If you're working with tiny vials, this will likely be gemstone shards. Herbs: Any herbs that fit your purpose and are safe to handle will work perfectly. If you're working with whole herbs, crunch or grind them up in advance. 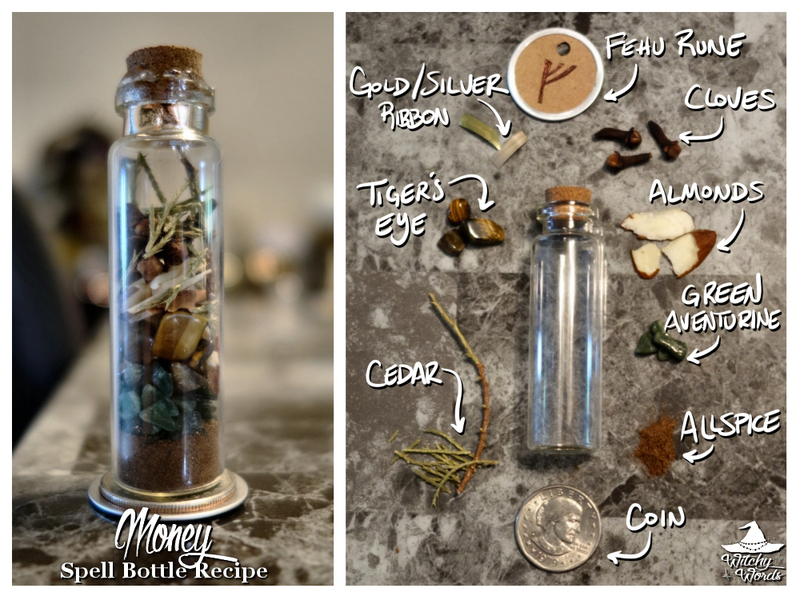 Keep in mind that herbs that aren't properly dried may mold inside the bottle. This may be something you want; that's your decision to make. Essential Oil and Dropper (and potentially a carrier oil): Essential oils are easy to add to your vials with a dropper. You may opt to include a carrier oil if you want your jar to be more liquid than solids so that you only have to use a few drops of your essential oil. Common carrier oils include grapeseed or olive oil. Paper/Pen: If you'd like to include written intent within your jar, a small piece of paper is the way to go! 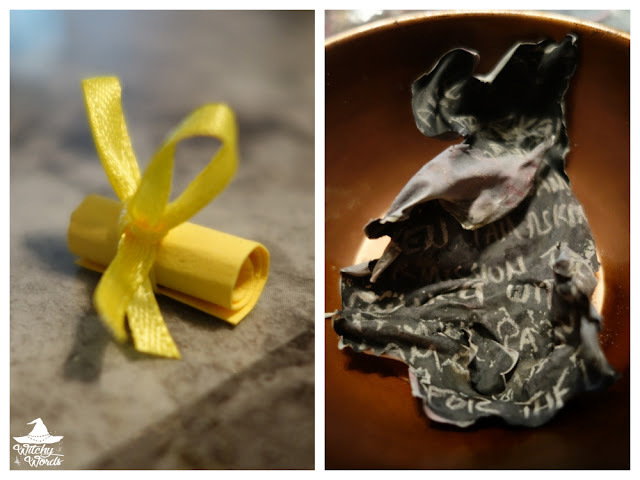 You can either roll the paper into a small scroll or burn it to use the ashes. 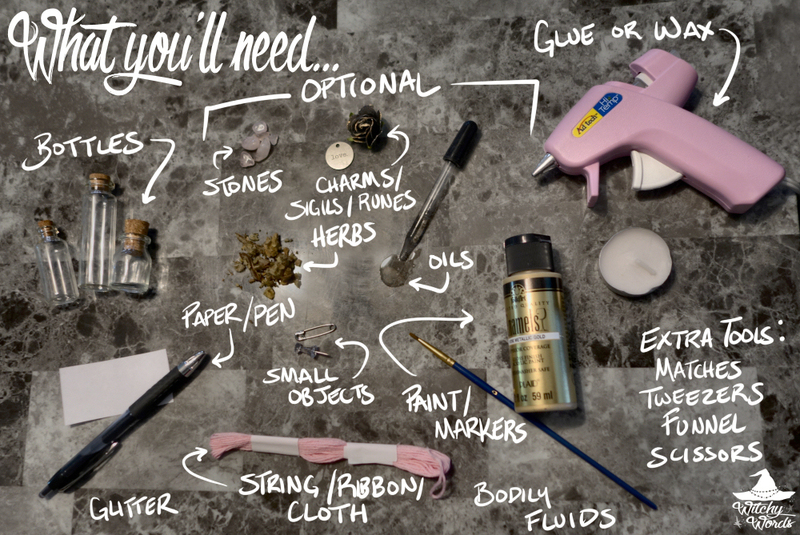 Small Miscellaneous Objects: Just about any object that will fit inside your little vial can be used as part of your spell! This includes nails, safety pins, push pins, charms, glitter, etc. Bodily Fluids: Depending on the purpose of your spell, you may find yourself in need of some sort of bodily fluids - presumably your own (I would not suggest using someone else's as that's hazardous material). Bodily fluids can range from the tame spit to the edgier blood or urine and more. String/Ribbon/Cloth: String, ribbon or cloth can be used in a variety of ways inside and outside of the vial. You can tie it around an interior scroll or set of objects, drop it in as its own representation or decorate the outside. 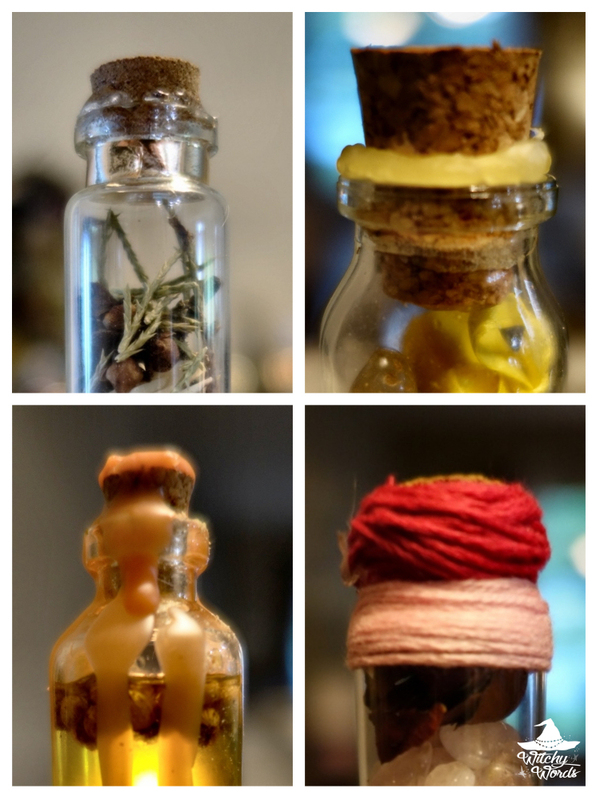 You could even tie it around the neck of the vial to create a necklace or hanging charm! 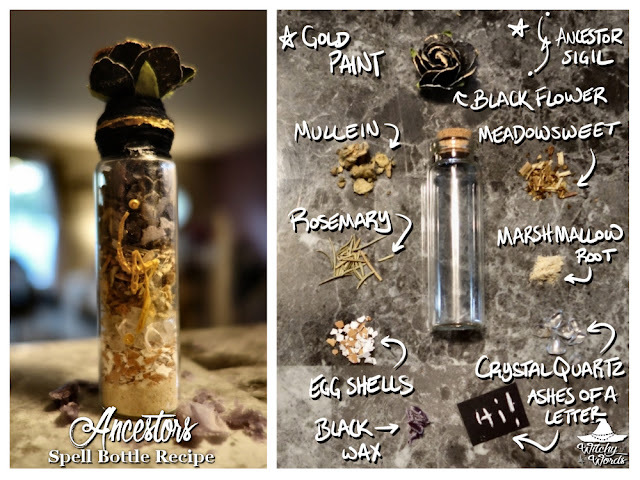 Charms/Sigils/Runes: Anything you can string or glue to the outside of the bottle can be used to add energy and label your spell! Paint and Small Brush or Paint Marker: If you'd like to add some color to the outside of your vial, be it decorating the lid or marking it with a sigil, paint or a paint marker is a great way to go! A Small Stick or Tweezers: This will help you move things around once it's in the vial or pick items out that get stuck in the opening. 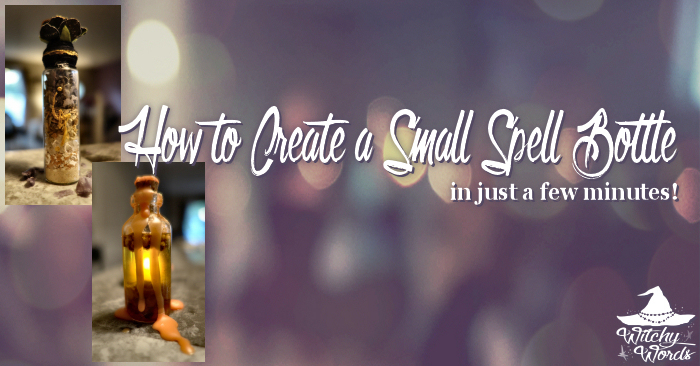 A Small Funnel: To help you pour ingredients into your bottle without making a large mess! Your first step is to select the vessel you're going to use. This can be anything from the tiniest vial to a large jar. I prefer glass, but it could be made out of glass or plastic (I find plastic definitely has its purposes within the Craft!). Your vial may have a screw lid or a cork - or some other form of topper. Whatever it is, you'll need it on hand as it's the carrier for your spell! Next, you'll want to gather the contents of the vial. This may require you to look up correspondence charts or dig through your cabinet. You might find you want to go to the store to buy something, though I only used what I had on hand already. The best part about these is that they can be created on the fly with tools you already own! You may want to use some special tools, such as tweezers, a small stirring stick or straw, and/or a funnel. These simply help you arrange your vial if you're particularly picky about how it looks, remove items or debris from the opening and put ingredients into your bottle without making a large mess. They are absolutely not necessary, however. Now, you'll need to prepare any ingredients that aren't ready. This includes writing on paper to create scrolls or burning said paper for its ashes. This may also include grinding herbs or mixing oils, depending on your needs. 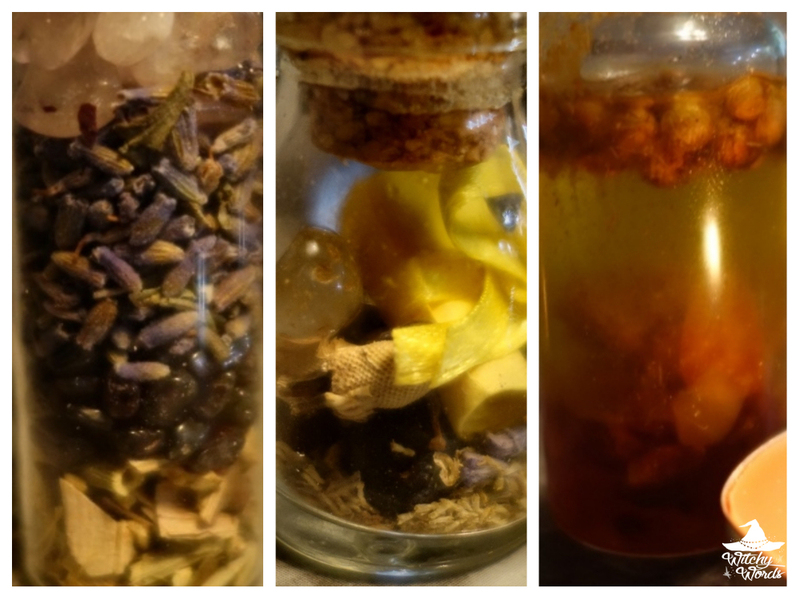 Have each ingredient ready and accessible before you begin putting your bottle together! Next, you'll want to heat up your glue gun and/or light the candle you're using. 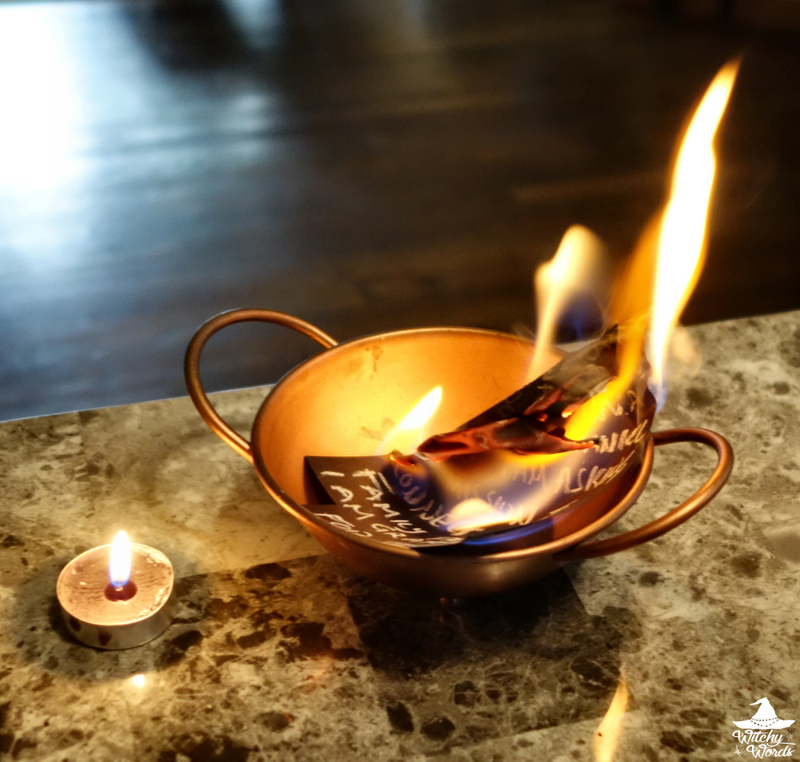 You may also use a piece of wax and a wax warmer to get your sealing component. Whatever it is, it'll take a few minutes before you can use it properly. Especially with candles, you may see their lighting as a component of your spell work. Now you're ready to begin the spell by inserting your spell ingredients into your vessel. There are a variety of ways you can tackle this! Your bottle may be mostly dry ingredients or mostly wet - or somewhere in between. You can fill your bottle all the way to the top or only half-way - or even barely at all! You might want to let them mix or you may want to have them evenly layered. If you plan to evenly layer them, you'll want to work from finely powdered to bulky in dry situations and from heaviest to lightest for liquid. It all depends on the kind of spell you're doing, the availability of your ingredients and what you envision for the container's final appearance. However you do it, this is the time to think of your intent and insert that energy, along with the ingredients, into your vial. If you're using a wax candle, you can drip the wax onto the lid. You can also use wax or glue on the inside of a screw lid, or pour it over the top. If you don't have a lid, you can create one from a cotton ball or tape and seal it with glue or wax! 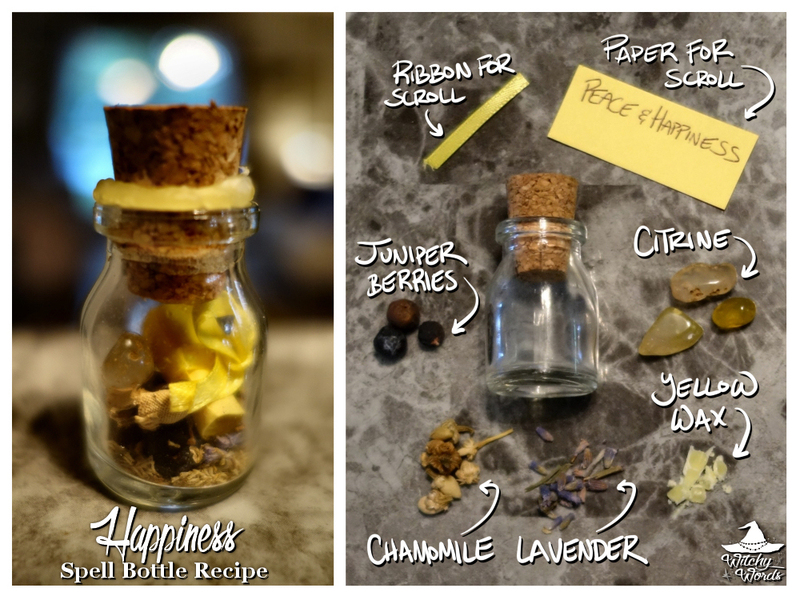 Finally, you can decorate the outside of your bottle if you like! 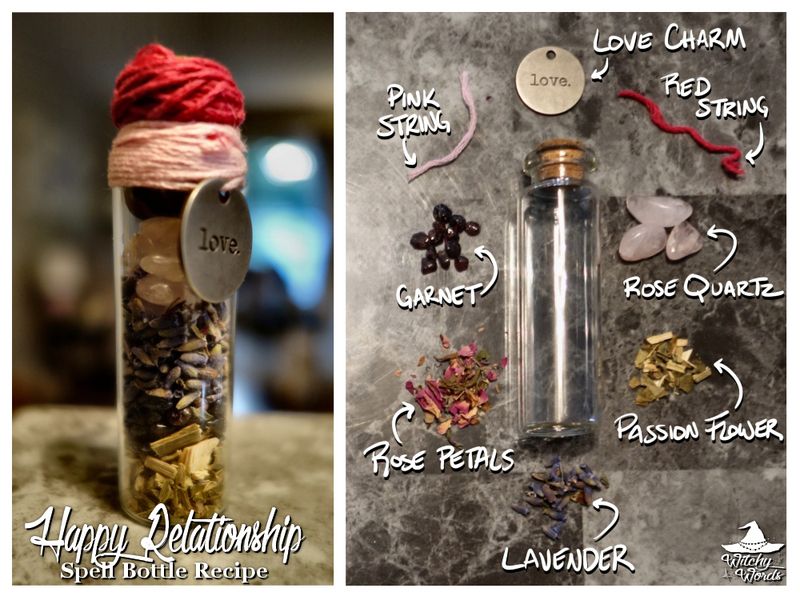 You can wrap string or ribbon around the neck, lid or the entire bottle. 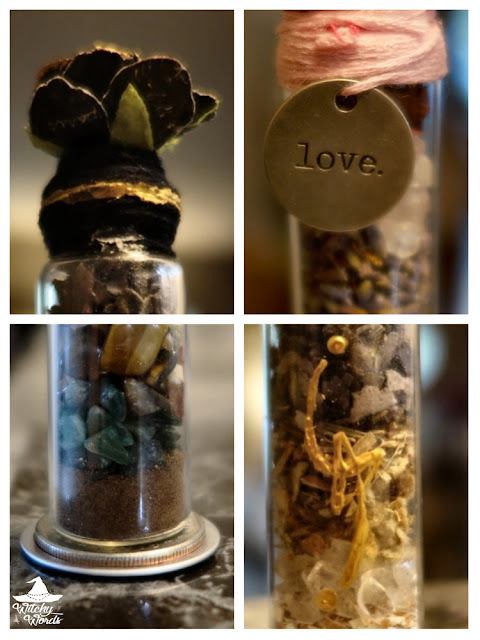 You can string charms on the vial, glue trinkets to the top or even paint your bottle as you see fit. You can use sigils on the outside or underneath as platforms for your bottle. You could very well be done after sealing your bottle and skip this step altogether. It all depends on your intent and what you're comfortable doing. The possibilities are endless! 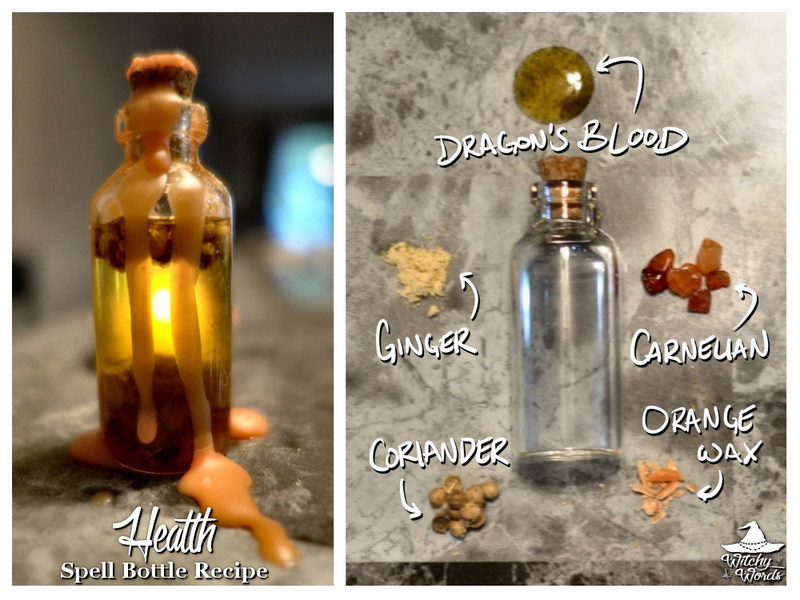 Once you are done, you should have a spell bottle ready for use! Give it one final charge and fill it with its purpose. You can then wear this as a necklace, carry it in your pocket, hang it from your rear-view mirror, place it under your car seat or in a desk drawer, set it on an altar or even bury it (given that it's either biodegradable or you'll be digging it back up later). The choice is yours! Once again, please use caution when dealing with hot substances like hot glue or wax. Use a heat-resistant surface if you plan on pouring the wax down the jar. Blow out your candle before using the wax so you're not fighting the flame. Prepare to get some wax on yourself and know the proper first-aid procedures to follow should you get burned. It's helpful you use a stirring stick, thin straw or the back of a small paintbrush to move ingredients around within the vial. It'll also help you flatting things out to make more room if needed! If ingredients get stuck in the opening, a pair of tweezers should pull them right out! If you're dealing with a small opening, tiny funnels typically used in glitter crafts are wonderful for directing your herbs. You can also make one from sturdy paper! Be sure you can handle everything involved in your spell. Some herbs are dangerous if you get them on your hands. Essential oils can sting or cause allergic reactions when not diluted. If you have an allergic or chemical reaction, take the proper steps and seek medical attention. Don't feel like you have to use every kind of ingredient listed! 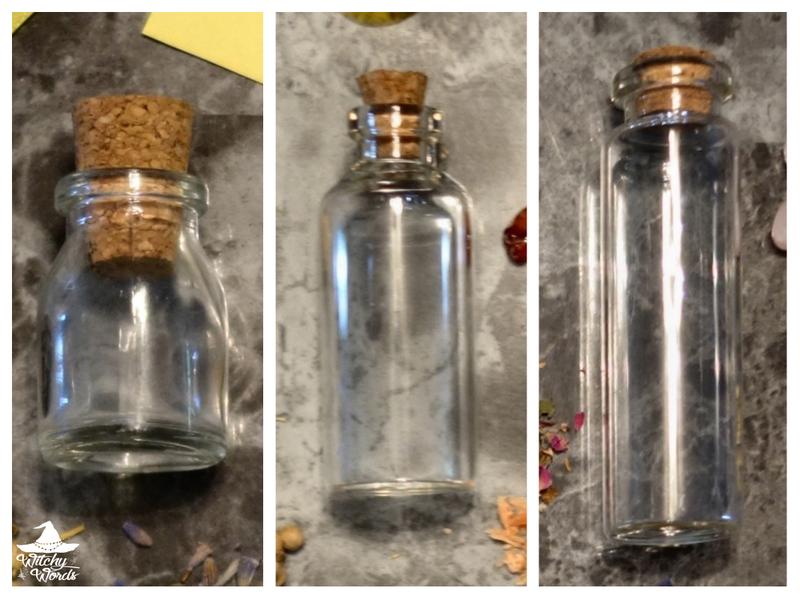 A sealed container with one item and intent would be plenty to officially create a small spell bottle. I try to limit myself to 5 components, but I admittedly sometimes go far over that. You're very welcome! I'm glad this post helped! Thanks for the inspiration! I’m going to try some of these out.